butter London Marrow nail lacquer with flash. 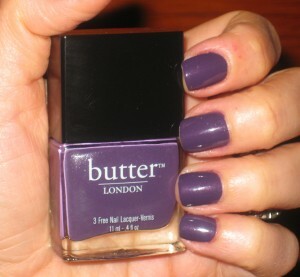 The nail de la semaine is from butter London in the color Marrow ($14 US/ .4 fl oz.). This line was created by British entrepreneur Sasha Muir. butter London’s whole campaign centers around being “3 free”: no formaldehyde, no toluene, and no DBP. These carcinogens, accumulate in the body which may cause Cancer. Most nail polish brands have switched over to the 3 free concept; OPI, Chanel, Deborah Lippmann (she claims to be 4-free), Essie, Rococo, Estee Lauder, Dior, Zoya, etc.., just to name a few. butter London Marrow nail lacquer is unique, in that, it has a flattering cool purple undertone which meshes nicely with my skin tone. The color is not anywhere what I envision real marrow to resemble, at least not the marrow in my Osso Buco. Oh I’m getting hungry. I digress. butter London Marrow has a smooth, silk like consistency with a sight silver/baby blue shimmer thrown into the mix. butter London Marrow nail lacquer in natural light. Marrow appears to resemble a cream finish when applied on the nails; the shimmers magically disintegrate into the stratosphere. This polish lasts for four days before any noticeable chipping, however there seems to be significant tip wear by the second day. As always, wear time depends on one’s daily activities. There is one obstacle which prohibits this blogger from future butter London purchases….the brush. The bloodly brush is so darn thin! My wide nail beds require a more robust brush to carry out the job properly. Instead of the 3 stroke method, this polish demands at least 5-6 stokes per nail. As you can imagine this can be very time consuming and harbor uneven results. I will limit my selection to this one shade in hopes, butter London will redesign the brush to accommodate a wider range of nail beds. Brush Comparison: Rococo DNL, butter London Marrow, Deborah Lippmann. Butter London offers a very eclectic range of colors and textures. They are sold in Macy’s, Ulta, Nordstrom, and several online retailers. 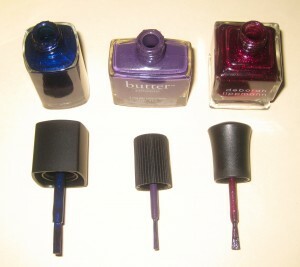 Makeup would tell you butter London’s 3-free concept has spread throughout the nail polish industry. The formula is smooth and rich, however, the thin brush may deter some from investing further into the brand. Individuals with narrow/shorter nail beds will absolutely adore this line. Makeup would also suggest, butter London Marrow Nail Lacquer morph into Succulent Grape, seeing how that would be a more delicious and appropriate name. Be well and stay safe.